3 Reasons Your Hair is Dry and How to Fix It | Stylistic Inc.
We all desire shiny, lush hair that doesn’t just look healthy, but is healthy. However, sometimes factors like the weather, the products we use or how often we use them can affect our hair’s moisture, causing it to dry out and feel unhealthy. 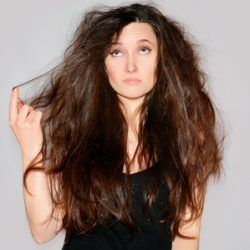 So, the best way to fix your hair’s dry spell is to understand what’s causing it, of course! Hair care processes that affect your hair’s natural levels of moisture can cause some unwanted dry locks. Though it feels counter-intuitive, washing your hair too often may decrease its natural oils, leading to dryness. Similarly, dyeing your hair often strips the hair of moisture and leaves your locks thirsty. Curling irons, flat irons, hair dryers: we apply a lot of heat to our scalps to get our hair styled in the perfect way. We put our tools on a higher setting in the hopes of styling faster, and repeat this routine each day until our luscious, shiny locks are dry and lifeless. Drying your hair too often leads to less moisture in your hair, leading to the dreaded dryness. Our bodies are multifaceted, complex systems where one condition sometimes causes another. This is true of hair, where having a specific medical condition causes your hair to react negatively and dry out. Thyroid issues like hypothyroidism can make your hair dry and brittle, as do hormonal changes like taking new birth control pills or pregnancy. So, how do you fix your dry hair? The answer is moderation. Avoid washing your hair every day, use heated tools less frequently, and slow down hair care practices like dyeing, that strip your hair of moisture. Seek medical care for any underlying healthcare issues, and ask your doctor for the best way to address your dry hair based on the condition you have. Keep your hair healthy and smooth with help from the experts at Stylistics Inc. Whether you’re in need of a Follea wig, hair replacement system or hair extensions, we have you covered. Give us a call at 602-234-3381 today to schedule an appointment!